Here come the holidays! I don’t know about you, but there are plenty of days when I am rushing around at dinner time to get something on the table that is nourishing, delicious and fast! This is a very moist and flavorful chicken dish that will have you out of the kitchen in no time. Serve it with a salad on the side. Preheat Oven 350º degrees. Cut the chicken thighs into quarters. Mix together Salt, Pepper, Chipotle & Cayenne. Heat 2 Tablespoons of Garlic Olive Oil in a large nonstick oven proof skillet over medium high heat. Add the carrots and sautee for 5 minutes until starting to brown. Remove the carrots from the pan and set aside. Add the other two tablespoons of Garlic Olive Oil to the pan maintaining the heat. Sprinkle the chicken with the seasoning and add to the pan. Cook the chicken four minutes without touching it, then flip it over and cook another four minutes. Zest the lime over the chicken, add the carrots back in to the chicken and pour over the lime juice. Toss to coat with the juice and zest and place the pan in the oven for ten minutes until chicken is cooked through. Serve! 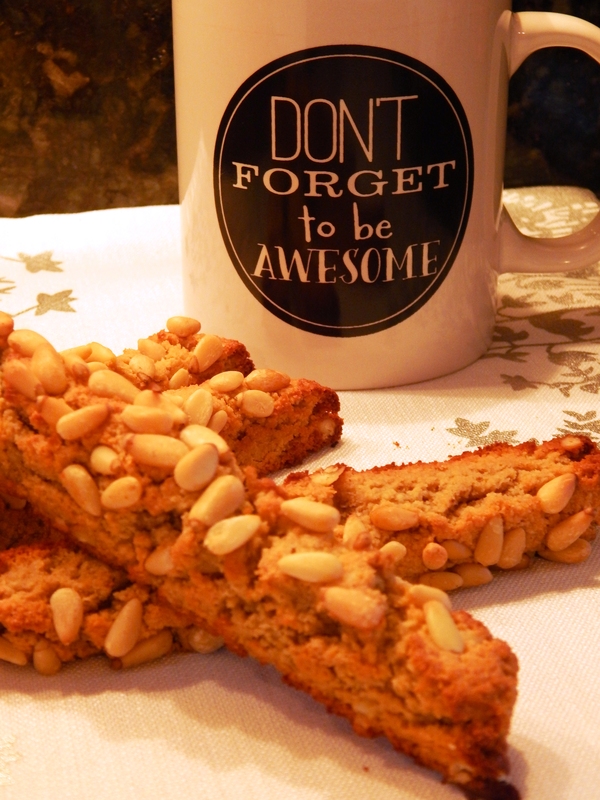 Anise Biscotti with Pignolis (Pine Nuts) is a classic! 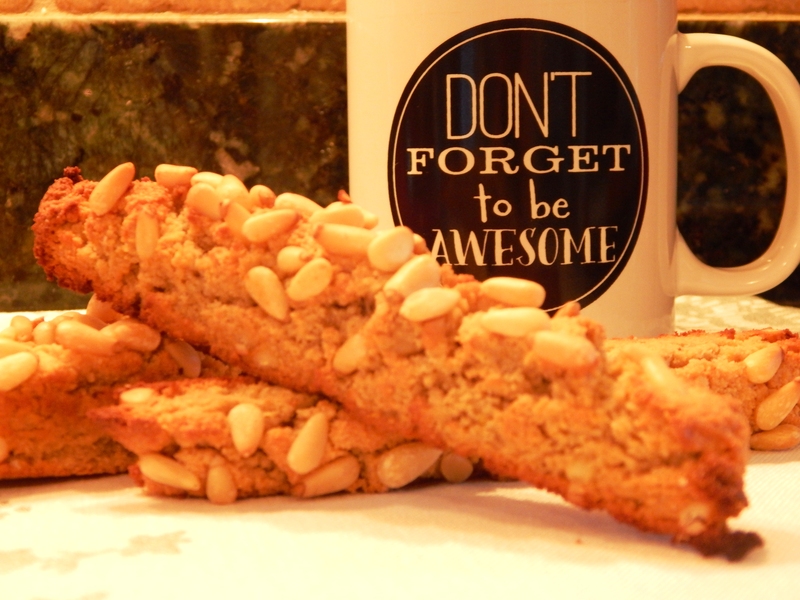 Hazelnut Biscotti is another classic cult favorite of biscotti lovers. There are a multitude of variations of biscotti today. But sometimes I really want a pure, unadulterated, classic biscotti. In this recipe the Pignolis give the biscotti great texture and a buttery flavor, and the anise seed is, well, just classic! They are a beautiful cookie! Preheat your oven 350º degrees. Lay out a parchment lined cookie sheet. In a medium bowl, beat your eggs. Stir in the clear honey and vanilla extract. In a separate bowl with a wire whisk, blend your dry ingredients (Almond Flour, Coconut Flour, Ground Anise, Baking Soda and Salt). Add the wet ingredients to the dry and stir to combine with a rubber spatula. Fold in 1/4 Cup of Pignolis. Turn out on the parchment lined cookie sheet and form into a 12×6″ rectangle. Press the remaining 1/4 cup of Pignolis into the top of the dough. Bake in the 350º oven for 20 minutes. Remove from the oven and cool completely. With a serrated knife, slice the cooled biscotti starting on the short end into 1/2 inch wide diagonal slices. Lay back on the parchment lined cookie sheet, one cut side down and bake for 7 minutes, turn the biscotti over to the other cut side and bake another 7 minutes until golden brown. 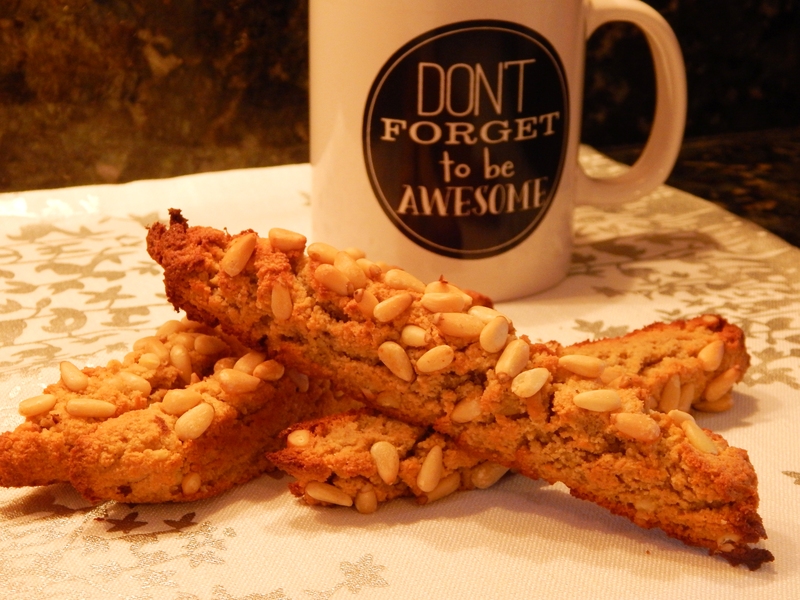 You can enjoy these delicious biscotti any time of year when you are in the mood for a classic flavor! Enjoy your day and keep being awesome!!!! Stuffing has always been my favorite part of the Thanksgiving meal since I was a child. 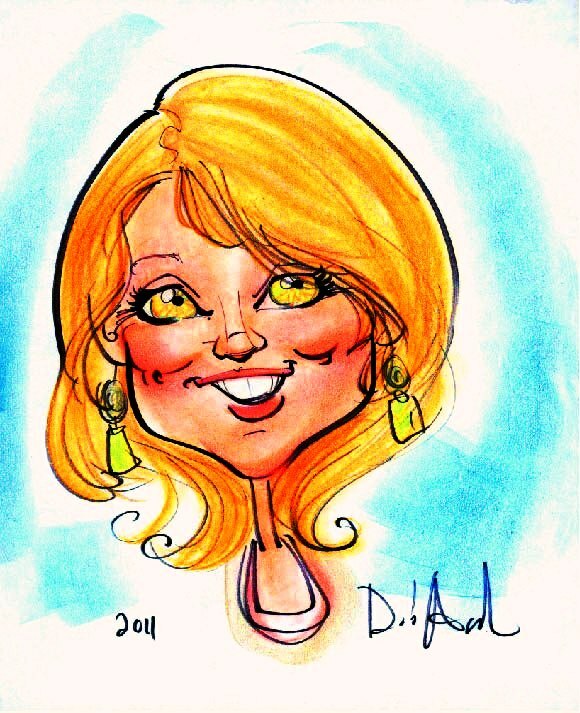 I used to be an Organic Artisan Bread Baker and sold my breads to the local co-op. I have had a serious love affair with really good homemade breads. Some of my fondest memories are of my mother’s homemade bread and how it made the kitchen smell. When my Mom went back to work when her children got older, my Pop took over the bread making. He used his own honey from the bees in the back yard to make his bread. Since going strictly Paleo almost three years ago, and then Paleo within an SCD Low FodMap template after discovering I had SIBO, I missed bread. I missed it more at first, and now I only miss it during special occasions when it is more the memories and emotional longing, because I am truly happy and feel amazing with my lifestyle and eating. 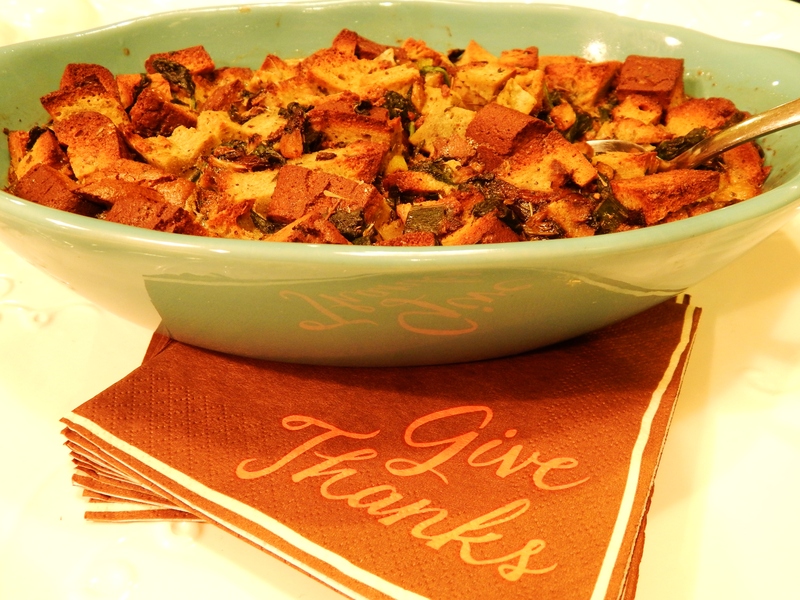 However, I am making this spectacular stuffing for Thanksgiving using Pumpkin Seed Blender Bread. It is absolutely allowed because the flour is pumpkin seeds! I found the recipe on fellow blogger Danielle of Its a Love/Love Thing’s website that is here. I made a few modifications taking out the sweetness of the bread, which is a very good loaf, and made it savory for use as a stuffing bread to create a stuffing recipe. You can feel truly good about this stuffing. The pumpkin seeds add so much pure nutrition. They are rich in magnesium, zinc (which is important for prostate health), may improve insulin regulation, contain phytoestrogens, tryptophan (so if you are having turkey too, you will get a good amount of that and should sleep like a baby), and healthy fat. But really, it is simply a delicious, traditional stuffing that you will love. No need to tell anyone how good it is for them, unless you want to, because they will “gobble” it up! Make bread as directed on Danielle’s website here omitting the honey, vanilla and cinnamon and adding 1 teaspoon each of thyme and sage and a 1/2 teaspoon of black pepper. Directions: Grease a small casserole dish, about a quart sized. Preheat oven 350º degrees. Place your bread cubes in a large bowl and set aside. In a dutch oven or heavy sautee pan add olive oil or duck fat over medium-high heat. Add the diced fennel and green onion, and cook for five minutes until the fennel is tender. Stir in the salt, pepper, thyme, sage and parsley. Add the spinach and stir until wilted. In a small bowl whisk together the eggs and broth. Fold them into the bread cubes, then add the sauteed vegetable mixture and incorporate that evenly. Pour the stuffing into your casserole dish, spread evenly in the pan and bake for 30 to 40 minutes until internal temperature measures 165º degrees and/or it is set. Mmmmmm, Stuffing! Good Morning! 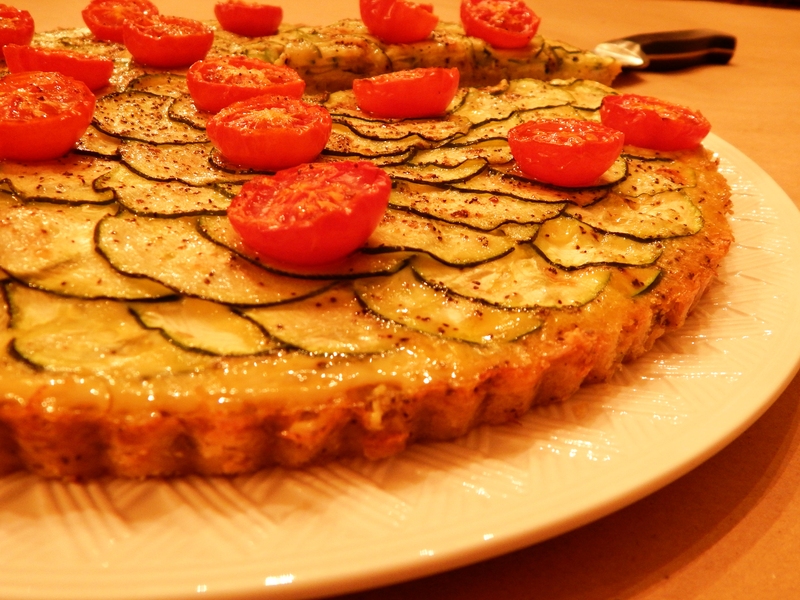 Want a yummy, pretty quiche that is easy but looks like it isn’t? I made this last night for dinner, and it is really good! It comes together fast, and the parsley, sage, rosemary and thyme in the crust is delish! It makes great leftovers also, or served cold for lunches. I used a 12 inch tart pan to make it, but a pie pan would work as well. Directions: Preheat your oven 350º degrees. Grease a tart or pie pan lightly with shortening and set aside. For the Crust, in a medium bowl, whisk together the dry ingredients. Melt the palm shortening and whisk into the almond flour and then the egg. Stir with a fork until crumbly and then press into the bottom of your tart or pie pan. Bake in the oven for 8 minutes, then remove and set aside. Slice your cherry tomatoes in half. Whisk two eggs in a small bowl, and add 1/4 teaspoon of salt and pepper. 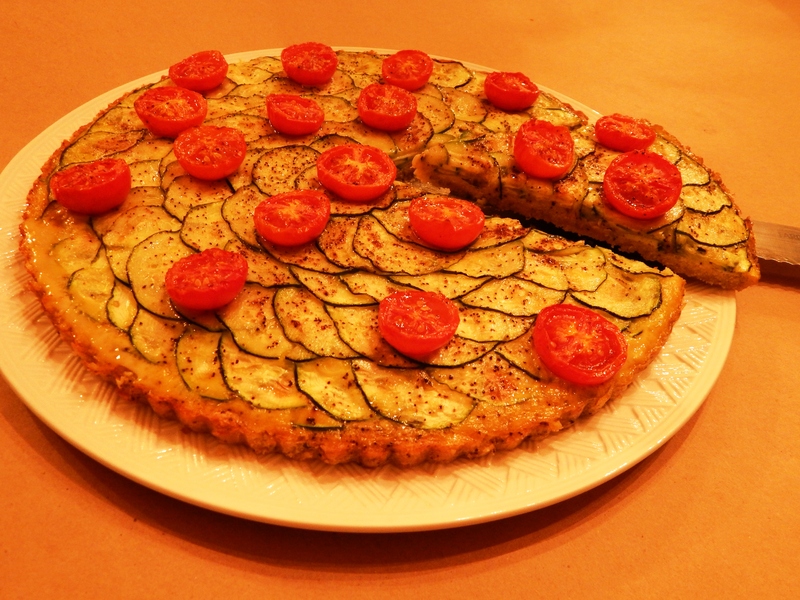 Pour the egg mixture on the tart crust spreading evenly, then make concentric overlapping circles with half of the zucchini slices, making a spiral. (See photo) Whisk together the last two eggs with 1/4 teaspoon of salt and pepper. Pour the remaining 2 egg mixture over the zucchini and make sure it is evenly spread. Layer the rest of the zucchini in a spiral again. Brush the top layer of zucchini with 2 tablespoons of garlic olive oil, and top with the cherry tomatoes. Sprinkle with a little, salt, pepper and nutmeg. Bake in the oven for 40 minutes or until eggs are set. If you use a pie pan, it will take about ten minutes longer. Remove from the oven, cool slightly, then serve. 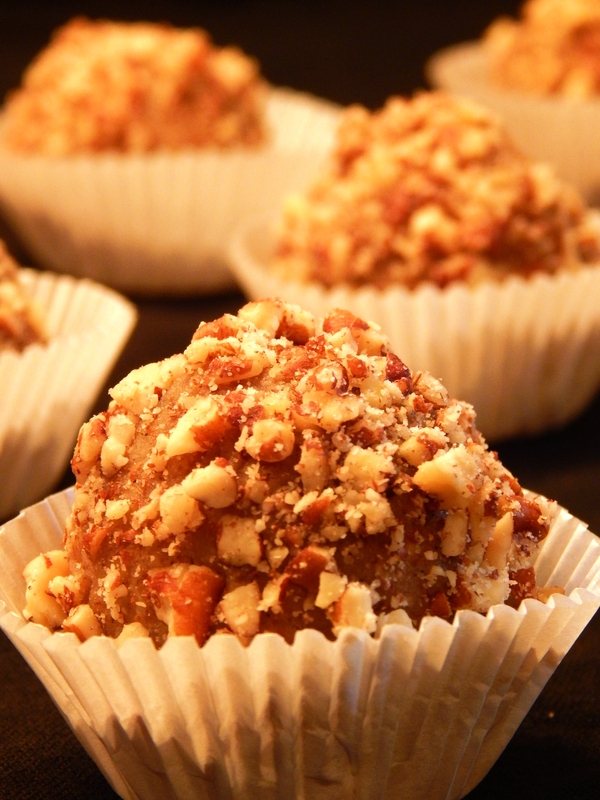 Truffles are such a treat for holidays! These truffles have just the right creamy mouth feel when you bite into them, with a little bit of salty and sweet and a hint of rum, which raises them to a whole new level of delicious! The cocoa butter melds perfectly with the almond butter to give you the creaminess everyone desires in a truffle. I love them as a special treat, and I think you will too. They are beautiful to give as gifts in mini muffin papers and then placed in a decorative tin, and equally enticing served on a pretty tray at a party. So, lets get to it! They aren’t difficult, but they are fancy! Preheat your oven 350º degrees. Place the pecans on a baking sheet and toast in the oven for five minutes until golden brown. Set aside to cool. In a double broiler (You can also use a saucepan and a metal bowl for this to substitute as a double broiler) place approximately 2 inches of water and bring the water to a simmer. In the top part of your double broiler or a metal bowl that will fit on the saucepan without touching the water below, place the almond butter, cocoa butter, honey, vanilla bean and Himalayan Pink Salt. Put the bowl of ingredients over the simmering water and stir with a wire whisk to melt and incorporate the mixture thoroughly. When the cocoa butter is melted and the ingredients well combined, remove from the water and stir in the rum and vanilla extract. It will be quite liquid at this point. Refrigerate the truffle filling in the refrigerator for 1 1/2 to 2 hours until it becomes firm enough to scoop and roll into balls, but not too firm. Meanwhile, finely chop your cooled pecans. I use a Mini Ninja Express Chop for this because it is fast and easy to clean up. 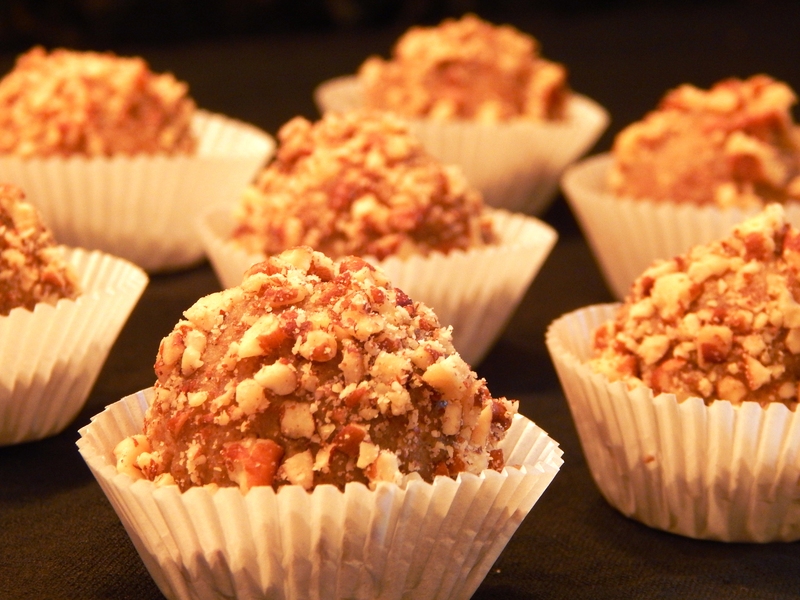 When the filling is set enough to roll, scoop the filling with a tablespoon cookie scoop, roll into balls and then roll into the finely chopped pecans. Put them in mini muffin cups and keep in the refrigerator. These will keep for at least two weeks. 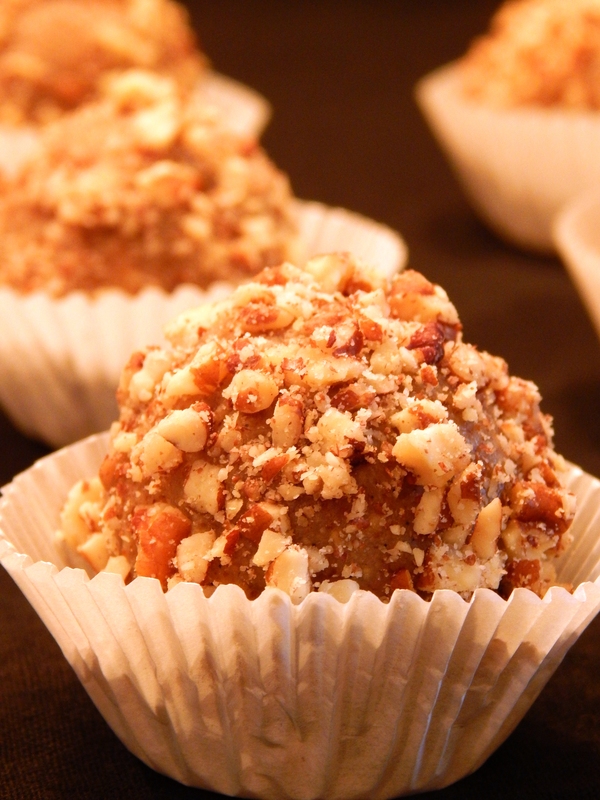 These truffles are pretty, delicious treats! 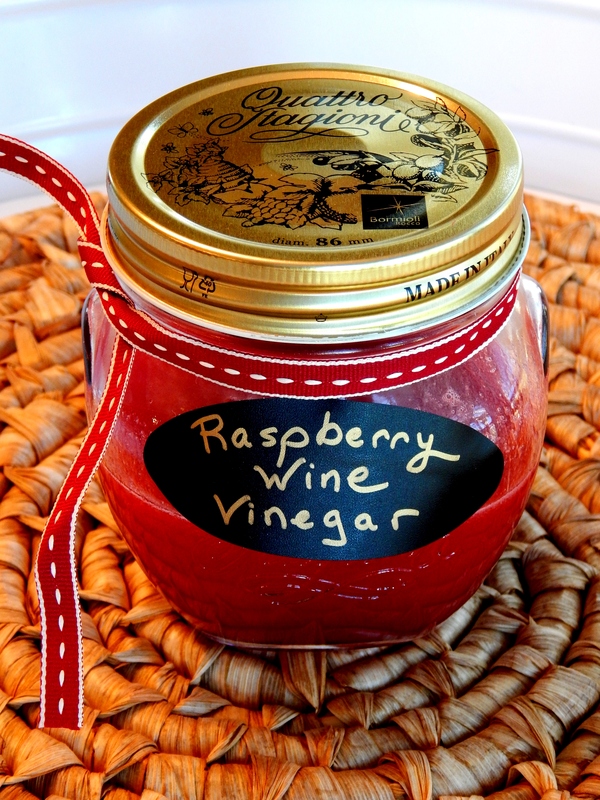 Raspberry Vinegar is one of my favorite ways to make a salad dressing. It is colorful and is one of my favorite fruits. Store bought raspberry vinegar is not allowed on the SCD diet because of added sugar, but this one is! It is made with real raspberries and red wine vinegar and is simple and fresh tasting with just two ingredients! Raspberries are loaded with Vitamin C and are an excellent source of Flavanoids and other vitamins. So here we go! The color is gorgeous! Place the fresh raspberries half at a time in a fine meshed sieve like this one. Hold the sieve over a bowl and press the raspberries with a spatula releasing the juice into the bowl and keeping the seeds and flesh in the sieve. Discard the seeds and pulp. Whisk in a half cup of Red Wine Vinegar into the raspberry juice (there should be half a cup of juice). Shake and store in the refrigerator to use as needed. That’s it! 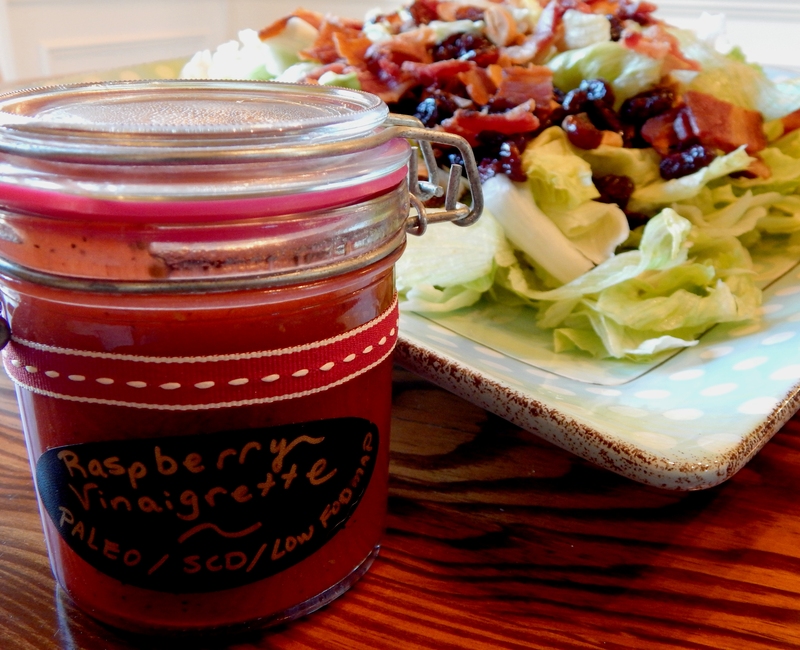 Now, if you love Raspberry Vinaigrette as much as I do, check out my recipe for Real Raspberry Vinaigrette here. 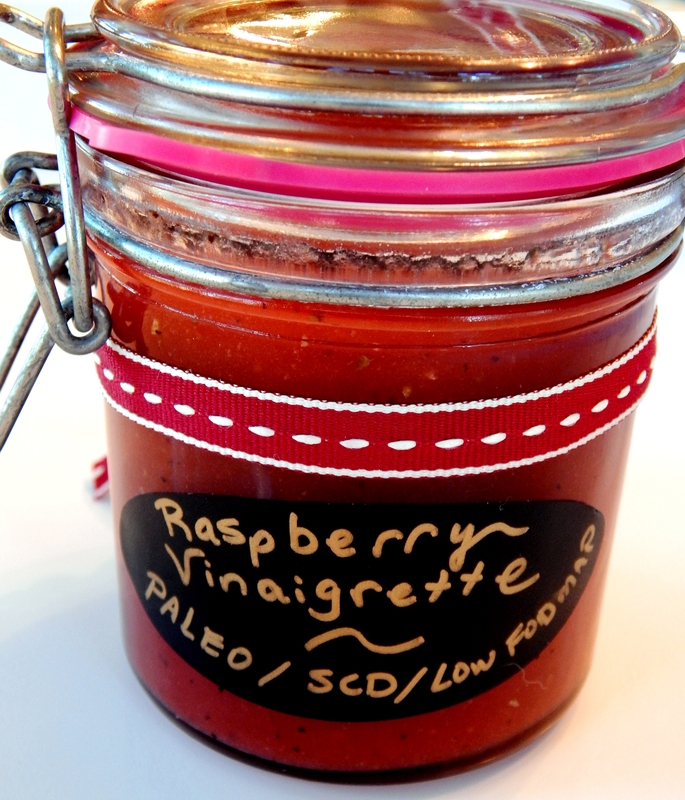 I have been really missing raspberry vinaigrette for my salads since starting the SCD, Low FodMap Diet. Here is a recipe for Real Raspberry Vinaigrette that had me wondering why I waited so long to try it. The seeds are removed from the raspberries using a fine meshed sieve to make the raspberry vinegar, recipe here, making the raspberries much easier on the digestion. Raspberries are loaded with Vitamin C and Flavanoids as well as other vitamins. This is a fresh, delicious salad dressing with an extraordinary color. It has good fat and lots of flavor! You will really enjoy this delicious dressing on a variety of salads! In a shaker (I use these and love them!) add all the dressing ingredients and shake well! Store in refrigerator. Makes 1 cup of dressing.